Preheat oven to 350° F. Grease a 9-inch square baking pan. Sift dry ingredients onto wax paper. Set aside. In a large bowl with an electric mixer on medium-high, beat oil, sugar, and eggs for 4- 5 minutes until thickened. On lowest speed, stir in orange zest and milk, followed by flour mixture and walnuts. Pour into pan and bake for 30 minutes. Let stand for 5 minutes. 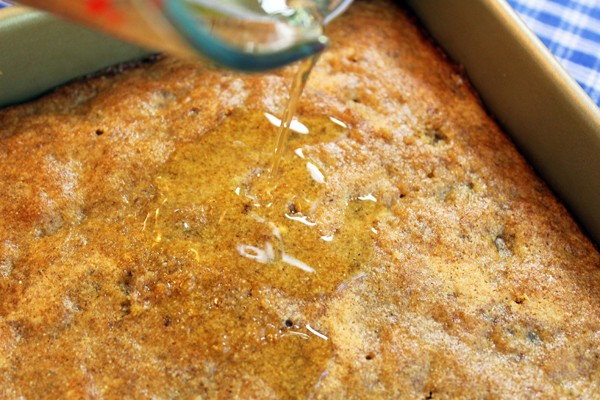 Poke about a dozen holes in the top with a toothpick and slowly pour the strained warm syrup over the cake. Syrup: While cake is baking, place syrup ingredients into a saucepan and bring to a boil, stirring until sugar is dissolved. Reduce heat, cover and cook for 10 minutes. Strain. 13 Comments on "Greek Walnut Cake"
This is really good! I was a bit worried about pouring the syrup since i dislike soggy foods but a overnight rest let the cake absorb all the spices perfectly. I love middle eastern stye cakes with the syrup. Can I use a sugar substitue for the sugar.being prediabetic. This recipe is the closest I’ve come across to my late mom’s recipe. I’m making this tonight or tomorrow. It’s the best recipe I’ve seen on-line, even better than recipes from Greece. I’ll let you know how it turns out. Thanks! I am half Greek, and I really like this. But, I only buy whole milk (3.8%). Hope it’s OK. It shouldn’t make a lot of difference. I wonder what it would taste like with black walnuts? Please report back if you try. The only part of this recipe that concerns me is the zest from a whole orange. Oranges come in different sizes. Are you referring to a naval orange? Seems like a lot of zest. About how many tablespoons would you say? It would be the zest of a medium (tennis ball size) orange. Thanks for the inspiration! We took this recipe as a base and used what we had in. We Swapped the walnuts for mixed seeds that we browned in the frying pan (no oil). We swapped the orange zest and lemon rind with a few large teaspoons of a sharp lemon and lime marmalade. We mixed the liquid ingredients in a blender then added the whole lot to our bread maker on the cake setting. It came out extremely moist and was enjoyed by all. This cakes without butter, can they be made in larger quantities and covered with fondants? How long can they last. I would not know how to make this cake in larger quantities. It’s not as simple as doubling the recipe and using a larger pan – adjustment would have to be made. I keep my cakes covered on the counter for two or three days and after that I refrigerate them. Ah, this cake was a favorite when I spent time in Greece. I will have to try it. There the walnuts are picked fresh off the tree and are very moist.